Hikashu, 2010. From left to right: Sato Masaharu, Sakaide Masami, Mita Freeman, Shimizu Kazuto, and Makigami Koichi. At the year's closing, I would like to express my gratitude for all the visitors. Since August 2009, this blog has been visited from 59 countries, including the United States, the United Kingdom, Germany, Greece, Russia, France, Italy, Canada, Brasil, Mexico, et al. Thank you all. 2010 is a great year for Hikashu fans. As of release, we have three reissues. 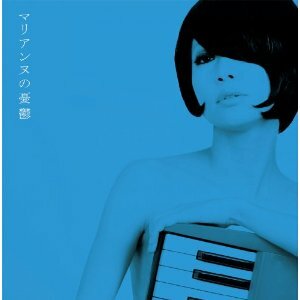 "1978" and "Watashi No Tanoshimi" had never reissued before, and "Ningen No Kao" had been out of print for years. Now they are back in print, as remastered edition, and welcoming addition to the catalog. The reissue project continues to the coming year. Right now, Makigami expressed that the band is considering "Hikashu Super Two" (a compilation of singles and rare recording) and much-awaited "Uwasa No Jinrui" for 2011. And new ones. The mastering of the "Nikoselon Three" EP is now completed and is waiting to be released on January 25, 2011. The new album is now in works too. As of live concerts, the fuji rock appearance was absolutely splendid. They performed superbly and proved themselves again being a strong live act. And the December concert with Inoyama Land and Kinoco Hotel was very vital and really one of a kind (Marianne Shinonome from Kinoco Hotel made a guest appearance at the Hikashu's set and provided hell of screams in "Yochu No Kiki"). The "Intimate Hikashu" concert at Yokohama Airegin was also important. It filled with improvisation and showed a refreshing approach. The regular dates at Kichijoji Star Pine's Cafe were always great and never fall short of expectations from the audience. There are already some dates announced for 2011 and we can expect them being an active live ensemble in the coming year. Let's hope 2011 will be a fruitful year for all of us. It is officially announced that АЯ will perform in Canada next spring. АЯ (pronounced a'ya), the trio with Makigami-Bairyshev-Sato, has been performed for years and their first album "Tokyo Taiga" is just released this year on John Zorn's label, Tzadik. Soon after released the album, they toured Altai and did 8 concert dates. Now they became a seasoned ensemble and fans in nearby area should not miss the performance. Experience the otherworldly music from Asia. Makigami expressed to play more dates in Canada if possible. If you have something in mind or are interested in booking the trio, contact him via mail or twitter. Speaking of Canada, a radio show "Délire Actuel" in Quebec selected "Tokyo Taiga" as number 10 on their "2010 Demanding Music Top 30." See here for the listing. Absolutely splendid! Released earlier this year, and overlooked, Tokyo Taiga is a gem of a record. Makigami presents a Siberian/Japanese trio of vocals, throat singing, jaw’s harp, percussion, trumpet, khaen, and delicate electronics (including a theremin). All original compositions, but you’d swear they were some kind of traditional folk music from a place cold outdoors and very warm indoors. The jaw’s harp playing is very creative and atmospheric; moving arrangements; lively melodies. For fans of Tany Tagaq and K-Space, although Tokyo Taiga is softer than either. The remastered edition released on December 23, 2010 on Bridge Inc.
"Ningen No Kao" ["Human Faces"] is the representative work of Hikashu in the latter part of 1980s. It contains a lot of important tunes and concert favorites among the fans still today. 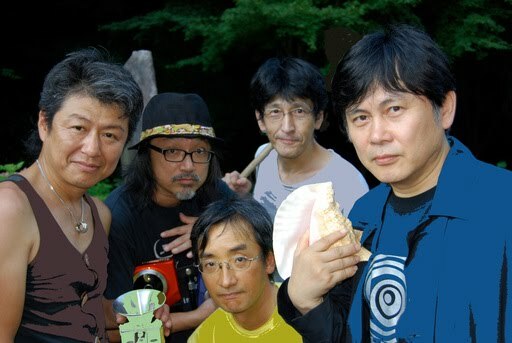 The four years had passed since the last album, Mizu Ni Nagashite ["Forget and Forgive"], and in the meantime, although not having a chance for recording in studio, the band performed regularly and wrote lots of new songs. It is also the first original album with Nomoto Kazuhiro and Taniguchi Masaru as a regular member. Both started supporting Hikashu in 1983 and became full member in 1985. Nomoto was still early 20s when he joined the band. Started to play electric guitar in high school, later in college he had an interest in improvising, switched to saxophone and played jazz. Soon after the graduation, he had an opportunity to participate a recording session with Hikashu through acquaintance and started supporting them in live concert. He quitted the band in 2002 and passed away next year. Taniguchi was also still in 20s when he joined Hikashu, but he already an established musician then. He had been playing drums professionally since early teens. Being quite experienced both in live and studio, he contributed the band greatly. Unfortunately, he passed away in 1989. "Ningen No Kao" is quite a lively and energetic album. And the remastering by Ono Seigen is very effective - you can hear the sounds you have never heard in the previous editions. An essential Hikashu stuff which no fan should be without. 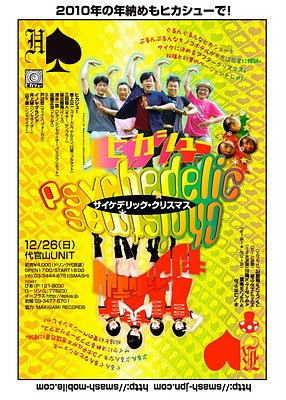 All the original members to play together for "Psychedelic Christmas"
On December 26, Hikashu will make a last appearance of this year with all the original members; Inoue Makoto, Yamashita Yasushi and Tobe Satoshi. Inoue and Yamashita have been making music together since 1977. Tobe, being retired from music after quitting the band in 1981, is going to play on stage again with his saxophone. 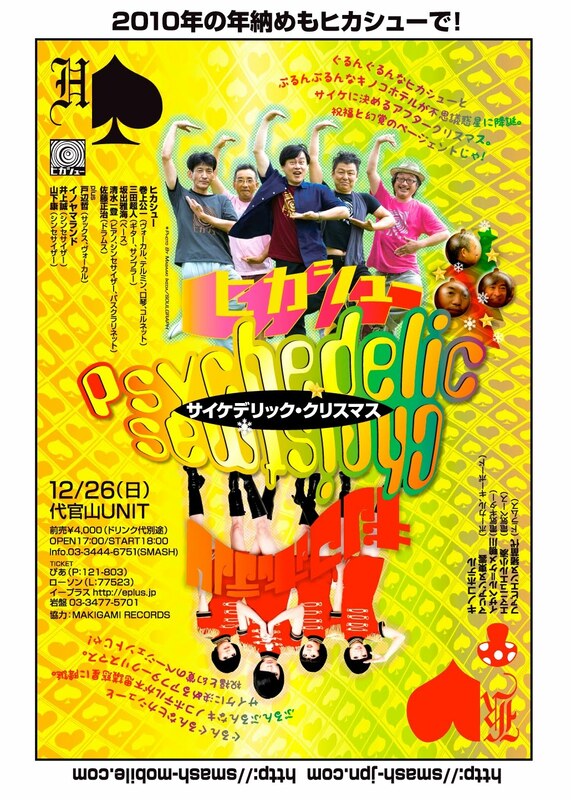 The special concert at year's end with the original line-up was held in 2008 and 2009, and this is the third time around. The last two times the band did a set of rarely-played numbers and this time surely going to be a memorable evening again. Kinoco Hotel is an all-female rock band formed in June 2007 and they are going to play at the Hikashu's concert on December 26 as an opening act. Its members are Marianne Shinonome (vocal, organ), Isabelle-Keme Kamogawa (guitar), Emmanuel Kominato (bass) and Fabienne Inawashiro (drums). Being distinctive with its look and sound with organ and fuzz guitar, Kinoco Hotel (Kinoco means "Mushroom" in Japanese) is soon recognized as an emerging new act and landed a contract with major label, Tokuma Japan Communications. 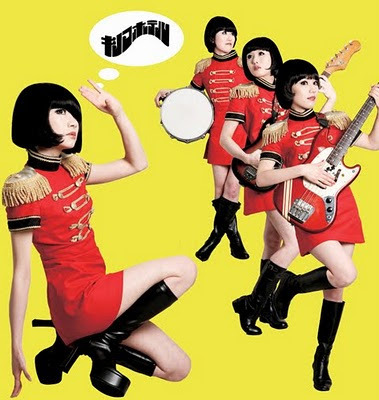 Their first album entitled "Marianne no Yuutsu" ["The Melancholy of Marianne"] was released in February 2010. Actually, they are a concept band. All the members conceal their real identities and are playing some characters instead. The concept is that they are all working for an imaginary accomodation facility called Kinoco Hotel, which Marianne Shinonome is "the manager." Shinonome, the leader, is known to be a fan of Hikashu so naturally she is quite motivated playing with the band. Kinoco Hotel - "Moetsuki Taino"
Their first major TV appearance. The album "Marianne no Yuutsu" is now available via HMV Japan. Makigami recently uploaded a video of "Ikirukoto." It was recorded live on November 4, 2010 at Star Pine's Cafe in Kichijoji, Tokyo. Currently the number is usually played at early part of their concert. On the day, It was played after the opening, lengthy improvisation of the first set. "Ikirukoto" is the title number of the album released in 2008. On the album, its duration is about 5 minutes, but at concert, it gradually stretched as the band played it. Occasionally they played it over 15 minutes. The composition has a sort of open-form and now also works as a vehicle of collective improvisation. That's the reason why it tends to be played extendedly. The video quoted here represents well how the number is played at their concert, and also included some essential elements of the band's performance, which are a) collective improvisation, b) non-verbal voice performance, c) an extensive use of unconventional instruments for rock music (like toys, thermin and mouth harp), and d) a prevailing sense of humor. 4:42 - Makigami blew a mysterious kazoo-like pipe, instead of the cornet which he usually uses at the break. 5:37 - There was a public announcement (or a message of initiation) to the audience: "Welcome to our concert. Just relax, of course I know you couldn't. Probably you all embarassed being here but there is no help. Just give it up ... The door was closed and nailed! You could do nothing but sit down and listen to this thing!" 5:48 - the band started a music like matsuri-bayashi (Japanese traditional music for festivals), and along with it Makigami quoted the famous opening remark ("Jikan Kurumade Tsutome Masho" - "We'll do our best until the due time comes") of the brothers comedy team from 1960s called Toyo Hidemaru and Asahimaru. 6:36 - Makigami quoted a lyrics of "Tokyo Ondo," a big hit of 1933 and still immensely popular dance tune for bon odori, a popular dance for traditional summer festival in Japan (If you would like to know the dance more, see the Bon Dance Gallery). Although it was out of context here and probably he did it without any reason, the band quickly picked it up and provided a proper accompaniment. Of course it was all done spontaneously. It is a good example that everything could happen at their concert. A dance instruction video, using Tokyo Ondo for accompaniment. There is another video of "Ikirukoto" in December 2007 at the band's MySpace account. It is one of the earliest performance of the composition, fairly short and no stretched improvisation. For comparison, I provide a link to the video, here. Just take a look at how Makigami moved his eyebrows at introduction. Makigami recently uploaded a short film about mouth harp, which he made in 2001, on YouTube. He has been playing mouth harp for over 30 years and now one of the authorities for the instrument in Japan. 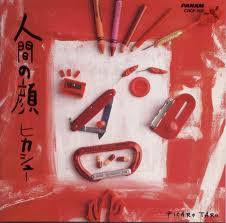 For instance, he played it on the first album of Hikashu, recorded in 1979. And his mouth harp solo is a regular attraction of Hikashu's concert. He even did that at Fuji Rock and got applauded. He said he will bring various types of the instrument in rarity and play them, so if interested do not miss the opportunity. In 2008, Makigami Koichi performed a solo set at a festival called "Colour Out of Space," held in Brighton, UK. The performance was documented on video by the organizer of the event. There are two parts of it and the latter part just turned up recently on YouTube. You might think some parts of the performance are in Japanese. Alas, no. This is completely non-verbal. Theremin is really a difficult instrument to play, notoriously hard one to keep in pitch. And look how he controlled it here. Not only that, but simultaneously using his voice. I have to say this is just insanely great. 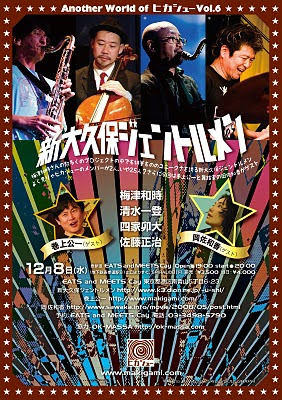 "Another World Of Hikashu" is a concert series which aim is to introduce various side-projects from the members to royal audience of the band. The sixth installment will be coming next week, and this time a group called the Shin-Okubo Gentlemen will appear. So what the band sounded like? Well, it's hard to describe, because what they're doing are not solely jazz, rock or whatever. Simply put, they play various kind of music, including jazz, rock, east european music (like Klezmar) and even Hawaiian. And some of them feature vocals. You might notice that all the members have some connection with Hikashu; Needless to say, Shimizu and Sato are the members of the band, Umezu has been a frequent collaborator of them for years, and Shika is a regular participator of Makigami's Cho-Kayou concert. Also, as always for the event, there are guests; this time are Makigami Koichi (vocal) and Oka Sawaka (dance). The Shin-Okubo Gentlemen at Shinjuku Pit-Inn on August 13, 2010. The band played "Koshikudake -'ole i pau ka'i'ini-" a Hawaiian tune composed by Shimizu Kazuto. Series #4: Arepos (Shimizu Kazuto and Reichi) with Sato Masaharu on percussion played "Cyfri'r Geifr," an original composition with Welsh lyrics, at Aoyama Cay on August 18, 2010. Series #5: Kuro Yagi Shiro Yagi (Sakaide Masami and Sato Masaharu) with Umezu Kazutoki (reeds) and Douguchi Yoriko (vocals) played "Jenny wa gokigen naname ["Jenny Got Moody"]," a popular number of a new-wave band called Juicy Fruits, at Aoyama Cay on October 27, 2010.